12in X 6in H burner Natural Gas Fireplace Burner has two burners for a nice full flame pattern in your fire feature. Available in sizes 12,18,24,30,and 36in X 6in. The uniquely designed burner allows gas pressure to be concentrated in center of both outer burners. This low profile H Burner has a connection on the side for installation on left or right in a fully vented fireplace. 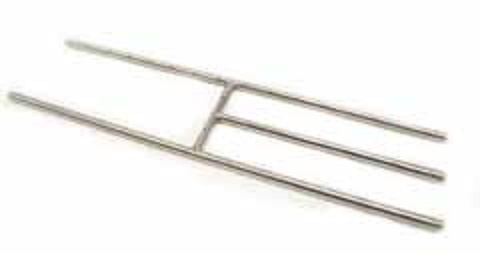 Because it is made of high quality #304 Stainless Steel tubing it can also be used outside in a natural gas fireplace or liner fire pit. Holes can be pointed up for glass or down in sand*. *This burner is meant for natural gas applications only. In a fully vented fireplace.